it's dark, cold and silent outside. inside rupert’s bedroom, there is only the faint humming of computers. he and his two friends, henry and kumiko, click their mice aggressively against one another. they are absorbed in some kind of fantasy rpg. henry rests his cigarette down to gulp down some coke. henry smiles and resumes the battle. Rendering visual the constant simultaneity of online and offline interactions that we sustain either with other individuals or our immediate surroundings, painter Felix Treadwell’s exhibition, Rupert and Friends, proposes these as characteristic of our contemporary experience. Airbrushing his canvases with subtly playful colours, the artist deftly incorporates his enduring engagement with comic books and anime into his paintings both in terms of content and formal arrangement. 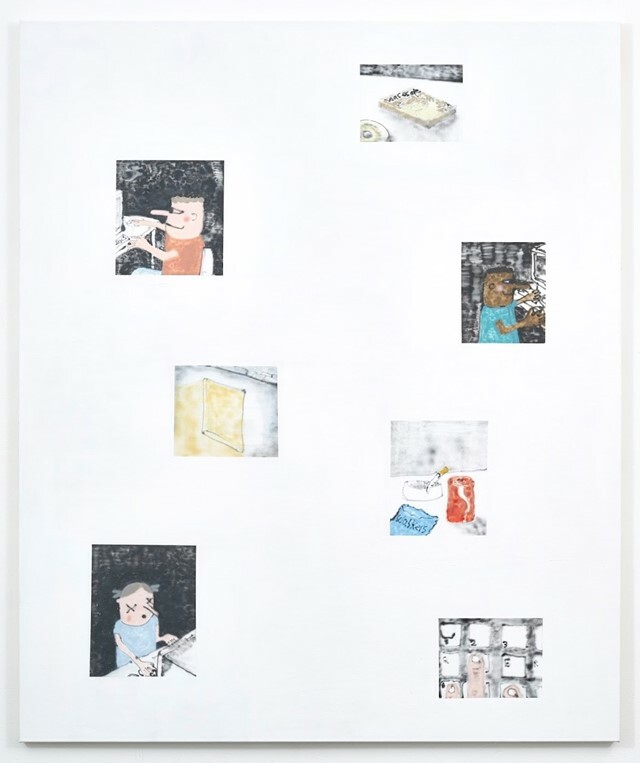 Initially constructing single works out of multiple canvases to mimic the format of comic strips, Treadwell has since begun separating each tableau with flat planes of white ground. Painting scenes into window-like sections on each canvas, surrounding his subject matter with negative space amplifies his figures’ monumentality. 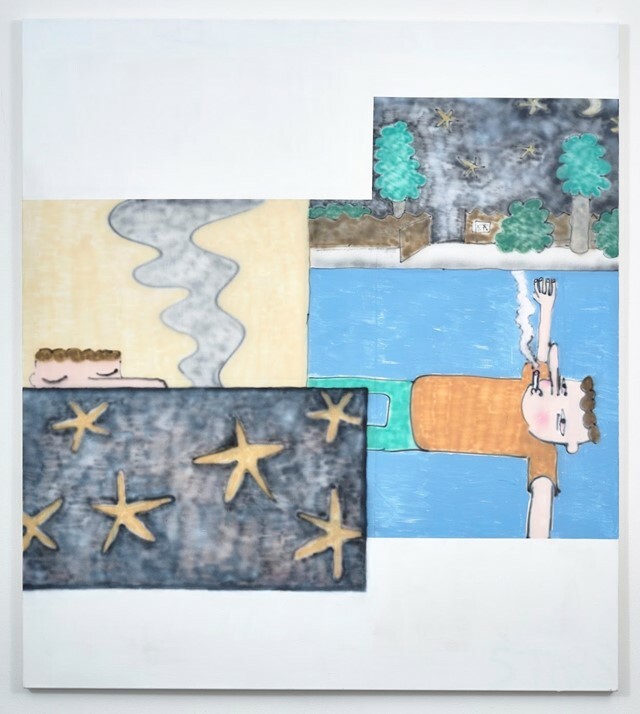 Treadwell bases his paintings at Union Gallery in London around an organically expanding network of largely imagined yet semi-autobiographical teenage characters he’s dreamed up, Rupert being the protagonist. 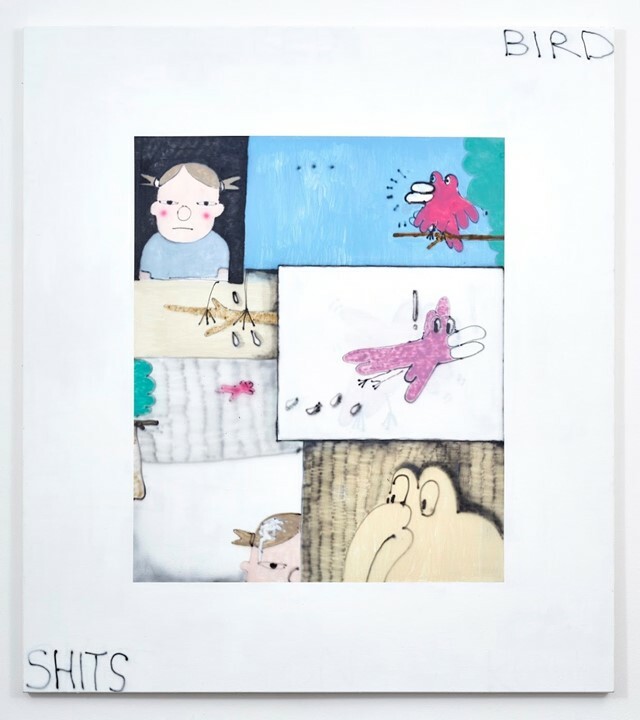 Reappearing throughout the artist’s first solo exhibition (curated by William Gustafsson), these semi-autobiographical characters converse with one another between canvases, driving ahead an undulating narrative of angst, anxiety, and passivity so emblematic of adolescent life. Veering around this lurking nostalgia, Treadwell implies a metaphor for the anxious and erratic miscommunications emblematic of our current juncture, while somehow comforting the viewer in a subtle and possibly accidental fetishisation of normality. Tell me about your cast of characters. Who is Rupert, how did he first enter a painting? Felix Treadwell: He emerged by accident in a painting I made in December. The design and name came from nowhere, but I realised there was more to this character than just this painting, I felt I could give him a story. Rupert became a starting point to explore concepts in future works through expanding his personal environment and experiences with his friends, Henry and Kumiko. What is it about Rupert in particular that you are drawn to? Felix Treadwell: He has experienced a lot of what I did growing up so it became very easy to build a world around his personality and habits. He is pretty naive and dumb, you kind of pity him, but I hope there’s something in him that makes you feel sympathetic and relatable to him too. What kind of activities do they get up to? Felix Treadwell: It started from Rupert’s bedroom, exposing intimate scenes of the teenagers getting together with their computers, but sometimes going to parks and sneaking off into the night. The stories appear innocent, but there are glimpses of a darker world and narrative within that. In this cartoon world, I want to just subtly give hints or glimpses as to where the narrative or character’s agenda is moving. Do you hope the viewers will relate to the characters? And if so, to what end? Felix Treadwell: I want them to. If the characters remind you or someone or something that would make you engaged with the work more. The characters are relatively stripped down and simplified, I want as many people as possible to imagine being one of the characters. Having met you, I can’t help but wonder if some element of Rupert is auto-biographical? Felix Treadwell: He wasn't intentionally supposed to be based on anyone in particular, just an average suburban white kid, but the more I've explored his narratives and personality I do feel he’s a lot like me. I wanted to build this world on what I knew and have experienced first of all. It was important that Rupert and his friends felt relatable, so by using my own experiences or recollections, it would help capture that. Rupert’s habits and tendencies are definitely things I have done or would like to have done as a kid, maybe if I was daring enough. I’d say his personality is slightly more amplified than mine, but I can easily fit myself into his shoes most of the time. Would you agree with the argument that the self, or one’s own identity is inextricable from any artwork? Felix Treadwell: I think it’s always present, whichever way you make work. I think you have to be honest and let it happen. It’s not until someone points it out that you realise how clear it is that our identity bleeds into it. Am I right to assume that comic books and anime constitute a major influence on your work? What do they offer you? It seems that this influence manifests both pictorially in terms of spatial mechanisms, as well as in terms of content? Felix Treadwell: I’ve always been interested in how anime and comics explore visual storytelling since a kid. As of recently, I've adopted some of those methods and formulas to help direct and add clarity to the narratives and stories within my paintings. Are there any references in particular that you return to continually? Felix Treadwell: Artists like Tove Jansson, Masashi Kishimoto, or TV shows like Pingu, Hey Arnold ie. nostalgic things that I can always go back to for inspiration. I remember I first watched Tekkonkinkreet, an early 2000s Anime by Michael Arias, about two brothers struggling to save their city from the seemingly inescapable threat of Yakuza mafia, of how invested and immersed I was in the journey that these two characters were going through. It felt so real and relatable, but I was still lost in a new world following their journey. The way in which it’s animated and drawn is beautiful too, definitely watch this film if you haven’t. Thinking about your use of text in a couple of the paintings, some of the activities Rupert gets up to, even some of the sculptural pieces I know might creep into the show… Humour seems important to you? How does humour transform an artwork? Felix Treadwell: I try not to force humour into my work, usually that seems to ends in failure. If it falls flat it can be very cringey. I think it is important, but let it come through accidents or by surprise, as long as the work is interesting. If an artwork can make you laugh, I’m pretty sure it’s a good artwork. You’ve also made giant felt heads for each character, in collaboration with your mum. These occupy a more sculptural dimension in the exhibition and signify a break away from the wall. What is the significance of this, and why this decision to allow your cast to enter the viewer’s immediate space? Felix Treadwell: I suppose it’s good for the viewer to experience some kind of physicality to the characters outside the paintings sharing the room with you. Saying that, I’m not entirely sure. I just wanted to try and make some new work with my mum in the process, they came out pretty well so that’s great. It’s the first time I’ve ever shown work where I’ve collaborated with someone, it’s definitely exciting and I’m open to it again. Cartoons seem to provide people with some sort of relief, some kind of catharsis from a world that is so increasingly obsessed with augmenting and fetishising reality that at a very basic level, it’s hard to tell what’s real and what isn't anymore. As someone who is touching on this genre, what respite do you believe relating to characters that are so far from reality provides? Felix Treadwell: I want to portray this world in the paintings as something different to our own, but allow glimpses of our reality in it so that it’s somehow almost recognisable. I think the characters are human enough to sympathise with, but it’s the relief of escaping into a world separate from our own which I find so exciting. I hope any person can take something from the characters or stories in the works.